WASHINGTON — How has the Orlando shooting slaughter affected the politics of gun control in Congress? A bipartisan House measure barring firearms sales to some suspected terrorists nicely captures the mix of new and familiar forces in play. The mere introduction Friday of a proposal backed by five Republicans and four Democrats highlights the post-Orlando, election-year pressures some lawmakers feel for action. One sponsor said that when the House returns from its July 4 recess, they will push GOP leaders for a vote. “The pressure will be continuous, it will be respectful but we’re not going to let go of this,” said Rep. Scott Rigell, R-Va. Yet Rigell also said to get a vote, they must show that their support from colleagues “eclipses that of the NRA” — an acknowledgment of the National Rifle Association’s formidable clout in Congress. No one expects lawmakers to broadly tighten gun curbs, even after the June 12 Orlando attack that left 49 dead, the worst mass-shooting in modern U.S. history. Yet a few small cracks are showing in the grip that Republicans and the NRA have long had on the issue. The new House bill is identical to a bipartisan compromise by Sen. Susan Collins, R-Maine, that the Senate sidetracked with a procedural vote Thursday. The NRA-opposed measure would block gun sales to people on the government’s no-fly list and to those required to be extensively examined before boarding a plane. Most Republicans voted “no,” saying it inadequately protected people erroneously on those lists. Yet seven Republicans joined Collins in backing the bill, an unusually high number. One of her co-sponsors was Sen. Heidi Heitkamp, D-N.D., who often supports the NRA and faces re-election in 2018. Three Republicans backing Collins have tight re-election fights this year. One, New Hampshire Sen. Kelly Ayotte, also voted this week for a more sweeping measure resembling one she’d opposed just seven months ago. Emboldened Democrats have taken the offensive on guns, an issue they’ve often avoided during campaign seasons. Though the GOP controls Congress, Democrats commandeered both chambers with a 15-hour Senate filibuster and a nearly 26-hour, old-fashioned sit-in on the House floor that won massive social media coverage. It’s “a sea change” for Democrats to challenge the powerful NRA deep in an election-year, says Arkadi Gerney, gun policy expert at the liberal Center for American Progress. While liberals are happy to attack the firearms lobby, Democratic leaders have often avoided the issue during election years to protect candidates in swing states with numerous pro-gun voters. Besides the sheer number of casualties and recent years’ spate of mass shootings, a political door has been opened by Omar Mateen, the Orlando perpetrator killed by authorities. An American, Mateen pledged solidarity to the Islamic State extremist group and was once on the government’s terrorist watch list. That’s let proponents cast the issue as one of national security — an easier political lift than gun control. It’s also invited a bumper-sticker, common sense-sounding appeal: No-fly, no buy, shorthand for keeping people on the no-fly list from purchasing guns. Also politically enticing: Mateen targeted a nightclub popular with gay Hispanics. Latino and LGBT voters are enthusiastic Democratic constituencies whom the party would love to bring to the polls in November. Republicans and the NRA have also characterized Orlando as a terrorist attack. They argue that Democratic proposals wouldn’t stop many terrorists and insufficiently protect gun owners’ rights. “Anti-gun politicians are exploiting a terrorist attack to push gun control,” said top NRA lobbyist Chris W. Cox. House Speaker Paul Ryan, R-Wis., said this week that Republicans “know that there is an issue” involving gun purchases by people on terrorist watch lists. “We want to get it right, while protecting people’s constitutional guaranteed rights,” he told reporters. The week started with the Senate rejecting four measures — two from each party — strengthening required background checks for gun buyers and banning many suspected terrorists from purchasing firearms. That’s become a recognizable dance as Democrats offer bills that Republicans say are overly restrictive, and the GOP counters with proposals that Democrats call too weak. This week’s roll calls showed that Congress clearly lacks the votes to enact major new restrictions on who can purchase firearms or other curbs. Another familiar pattern that Democrats hope is changing: Public interest in new gun limitations that routinely peaks after high-profile shootings but gradually fades. That leaves one significant group whose view on guns remains strongly linked to how they vote: Firearms enthusiasts. “The intensity is always with the gun owners,” said former Rep. Tom Davis, R-Va., who headed the House GOP’s political operation. 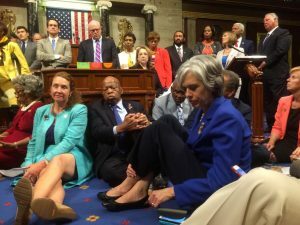 Left: A photo shot and tweeted from the floor of the U.S. House of Representatives by U.S. House Rep. Katherine Clark shows Democratic members of the House staging a sit-in on the House floor "to demand action on common sense gun legislation" on Capitol Hill in Washington, D.C. Photo provided by U.S. Rep. Katherine Clark/Handout via Reuters.